Did you babyproof your baby's room/ nursery? If you are one of those parents who think baby-proofing is for the time when the little one starts to crawl, you need to think again. So coming back to our topic, your baby's room/ nursery should be like her mommy's arms or daddy's lap - more safe than anything on this planet. Do you agree? 1. 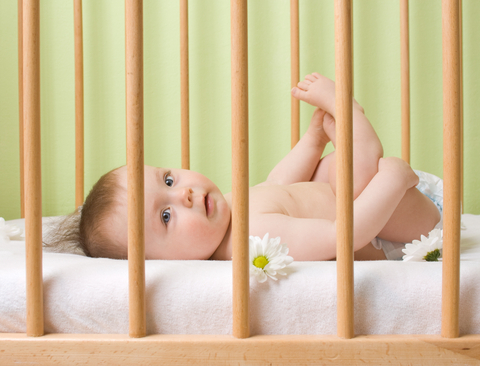 The Crib or Cot - Is it safe or not? A pricy crib/cot does not guarantee you safety unless you make sure it abides by the crib safety rules. Check out our article on buying the perfect crib for your baby to make sure that your cot is not just pretty, it is also safe! 2. Does the Changing Table needs a change? The changing table needs to be safe and its surrounding areas need to be safer, if God forbid, the baby accidentally rolls and falls. Never leave your baby unattended on the changing table even if your baby hasn’t started to roll over yet. When you change the diaper, make sure to keep one hand on the baby at all times. He or she may surprise you one day with a sudden move; so don’t make this surprise a shock and avoid the fall. Place your baby's nursery furniture wisely. The introduction of child proof locks comes very late; before that you need to consider other aspects. A crib near a window or curtains is never a good idea. 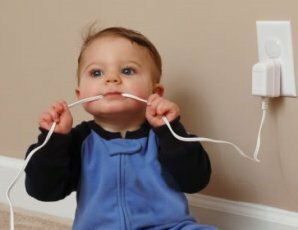 Your baby might seem too tiny for any adventurous moves at the moment, but before your know it, s/he might want to pull down the curtains, blinders or the cables hanging from the wall. A bag of cotton balls, baby lotion and infant nail clippers in your baby’s reach while changing the diaper, or in the lower most drawers when your baby is trying to crawl might not be a very good idea. 4. Is your baby allergic to lotion, wipes, shampoo or baby powder? Newborn safety is not all about furniture and sharp objects. To be on the safe side, you should start by introducing scent-free products as scented items may cause allergy or intolerance towards your baby's delicate skin. As the time progresses, you can introduce scented products slowly, but make sure they are for sensitive skin (often the label mentions something about being already tested and suitable for baby's skin). You can create your very own baby wipes by clicking here for a super easy & cost-effective step-by-step guide. Click here for help on skin rash and diaper rash. Make sure that the sheets and blanket are all tightly tucked in and you have not hung any towels or clothes on the rails of the cot. Loose baby bedding and improper baby mattress can lead to SIDS. Let's get back to the babyproof question where we started from. You have designed a really pretty room for your baby – the wallpaper, the cot, the stuffed toys all seem adorable. Your baby will feel like a prince/ princess in his/ her nursery. But the question is, will your prince or princess be 100% safe in his/ her kingdom? Also read: 5 Forgotten Areas to Baby proof.